Mini Tub Roll Off Container | Steel Container Systems Inc.
Mini tub roll off containers are an excellent choice for smaller waste and recycling needs. With incredible strength to weight ratio, mini tubs provide excellent payload opportunities. Mini tubs can be stacked and shipped in quantities up to 15 per truck load, drastically reducing the cost of shipping. Mini tubs are available in lengths ranging from 10-16 feet and perfectly fit single axle roll off trucks. 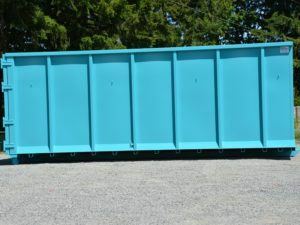 Double tapered sides allow you to stack up to 5 bins together! Stacking bins provide efficient transport or storage solutions. Provides improved structural strength and reduce the overall weight. Do you need paint colors to match your branding?Custom Colors Are Available! Increase the strength and durability of your bin with 10 gauge steel walls, front and door. Tailor the bin to your specific application! We offer a fixed roof or hydraulic lid with access hatches. SCS Roll Off Bins can be fit for any size hook lift, cable pull or dual purpose systems. Work with our design team to create a bin that meets your specific needs.